If your child needs help in the following areas, I can help you. Attention and listening - Does your child struggle to sit still and learn? Is he/she always running around the room and you find it hard to get them to engage with you? Language delay/disorder - This applies to both spoken language (expressive language) and understanding language (receptive language). Children can often have difficulty with both. Difficulties with speech sounds - (phonology/articulation/oro-motor). Some children have delayed speech sounds, others might have disordered speech sound development (ie not following the typical developmental pattern). This also includes physical difficulties articulating or sequencing the sounds for speech. See here to check the normal development of speech in young children. Learning difficulties - This umbrella term covers a wide range of difficulties which affect speech and language development. 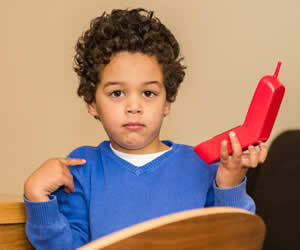 Autism Spectrum Disorder/Social Communication Difficulties- please see the 'Hanen, More than Words' page on this website. Parent training - nurturing you so you can nurture your families. There are many different ‘keys’, or techniques in a SLT's toolkit. Each child is different. My greatest skill is in creating rapport, the bond of trust. Let me get to know your child and what motivates him/her. Using play, specific therapy techniques and a great deal of fun, I will find the right key to unlock the doors to your child’s potential. Appointments take place at Lismenary Speech and Language Clinic (LSLC). Once you contact me, I will normally offer you an appointment within 2 weeks. What can I expect from my initial appointment? To begin with, I will talk with you, gathering information from you whilst playing and building a rapport with your child to help them to relax and feel like talking freely. I will use informal play, conversation and observation, and formal tests if appropriate. When I get a feel for your child's difficulties and what ‘makes them tick’, I shall start to try out various therapy techniques to see what best suits them. The session will last from 90 minutes – 2 hours. Following this you will be given details of the assessment result and plans for speech and language therapy. Therapy is normally offered in blocks of 6-10 weeks, with each weekly appointment lasting approximately 1 hour. Once a block of therapy is paid for, we can be flexible about when and where those appointments take place, according to the needs of the client. We can arrange twice weekly or monthly sessions if that is required. At LSLC, speech and language therapy is eclectic, using methods from various different sources. Treatment plans are tailor made for each individual. For children, my first priority is to engage with your child and help them to enjoy the games and activities, which are designed to incorporate their therapy targets. 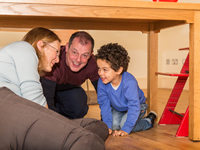 If we need to crawl under the table to learn the preposition ‘under’ – then so be it! The therapeutic process is dynamic and requires constant observation by the therapist, evolving and modifying the method according to your child’s response. Every week, I establish how far the child can be encouraged to go and then give guidelines to their parents for home practice. Parents/carers are required to take part in the sessions, observing and learning the essential skills to ensure that speech/language targets are carried over into the home environment. Do we have to do home practice? Life at home is too busy! Before I had children, I used to ask parents to spend an hour a day in a quiet place, practising the homework that I set. That was unrealistic! Now, all I require from parents is honesty about what they can realistically achieve. Practice is most useful when done for 5 minutes, twice a day. If you prefer to work on set tasks, that’s fine. If you are unable to set aside time for home practice, I will offer suggestions about how your practice can be incorporated into your daily life –after all, speech and language is an essential part of every waking moment. After each billing block of 6 sessions, you and I will review progress. We agree upon what basis we want to continue – have a break, carry on, meet less frequently, or end therapy. This might be because the treatment is complete with a good outcome, or maybe because therapy is no longer having the impact required by you.